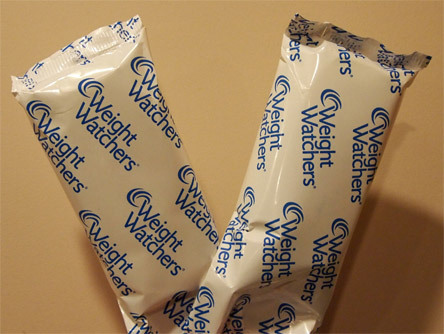 [New for 2013, discontinued] So Weight Watchers has really bulked up their frozen lineup this year. 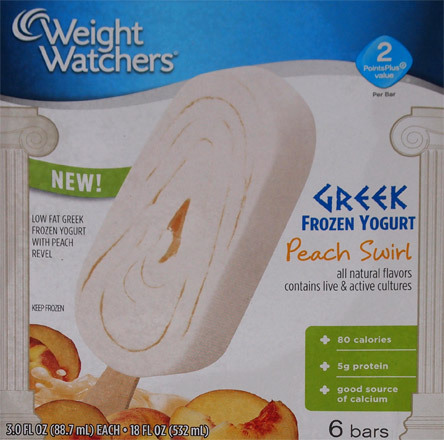 "Today" (also known as April) we're going to pull out the two new greek frozen yogurt bars from our free samples and see how they stack up. Billed as low fat greek frozen yogurt with a blueberry or peach revel, thess bars are a mere 80 calories a piece and a whopping 5 grams of protein. Sounds way healthier than eating a cookie, but does it taste better? I brought one of each from the freezer... but which is which? I decided to dig into the peach first... mainly because I asked my wife which one she wanted and she said blueberry. (DOH!) 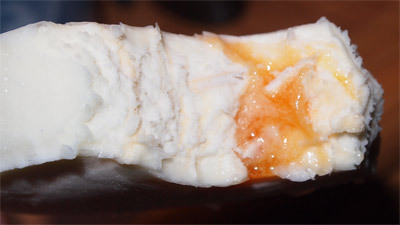 I take my first bite and it seems to have an icy coating on it, it's very thin though. I'm happy to report there's no tang, but there is something that is perplexing me. It's like an overly clean taste. It's different, that's for sure. It's potent, so it forces you to eat slow. You see, the base isn't vanilla, or even peach, it's (yogurt) flavored. All of the fruit flavor is suppose to come from the swirl. 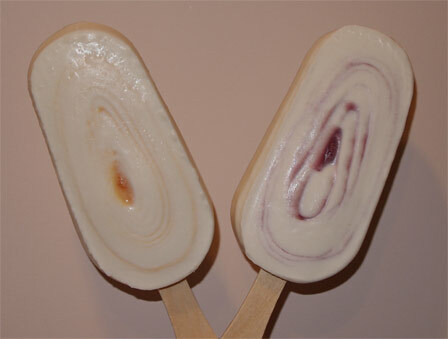 Looking at the picture, you can see that there's a little puddle of peach swirl in the middle and it's definitely tasty. I kind of wish there was more of it to balance out this treat. Let's try this again shall we? It's now in the waning days of summer and I'm in one of my "I gotta snack less" phases. The Nosh Show... oh, ok, my own love of eating, has been encouraging a little too much snacking recently. It's not that snacking is bad, it's that I haven't been careful about it. When I should be having 3 cookies, I have 6. When I go for one handful of chips, I take two. This adds up and it's not good me, or any of us really. So, for the last several days, I've been back in calorie counting mode. 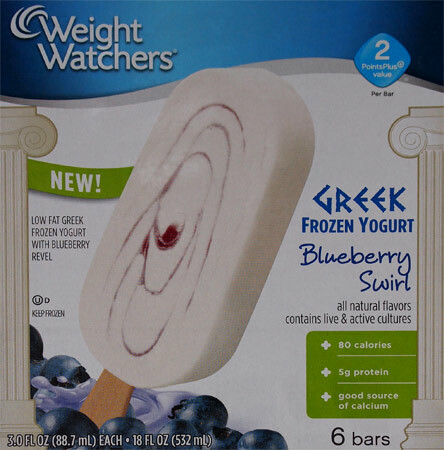 Today while I was mowing, instead of grabbing a Drumstick (like the one I handed to my daughter), I grabbed the weight watchers blueberry bar instead. You know what? I liked it. I went real slow and was able to pick up what seemed to be a mild vanilla flavoring to the base. In fact, I almost started having vanilla pudding pop flashbacks. Yet again I was pleased with the lack of yogurt tang. Lastly, I just plain enjoyed it. 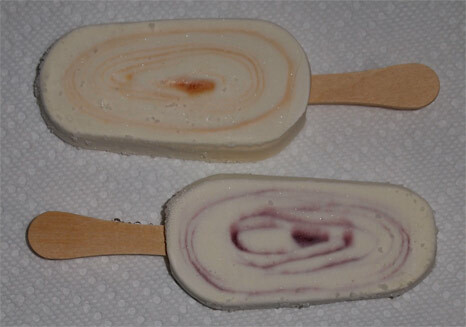 The blueberry flavor was real mild, in fact, it kind of tasted like peaches (maybe a little too long in the freezer?). The treat just worked, plain and simple. Have I mentioned my wife's a fan? Though technically she's a huge froyo fan in general, so this is a much easier sell for her. Me? I enjoyed it today. Yeah it's got that thin icy shell, but it holds everything together and keeps it from melting into a mess. Plus there's something simple and effective to the swirl. Sure it's not my style, but I have to respect the craftsmanship here. Good to know these aren't tangy! That's the worst thing with yogurt related treat. These are the best!! I am addicted. I am disheartened to recently find out they are being discontinued in my local Harris Teeter stores!! What's up? Where can I find them now? They have been my mainstay in staying on track with a great low point snack. Please help! !